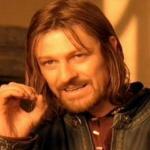 I could go one for way longer than a minute on all the BAD things he has done.... just this week! Gotta give me a few hours to recap all the vacations, golfing, parties, pardons, bowing to sultans, refusing to acknowledge allies, insulting allies, puffing himself up to the media, executive orders, shoving obamacare down our throats, insulting Americans, fueling racial tensions, appointing non American Muslim to commitees, telling America we are not a Christian nation and it was founded by islam, deals with terrorist organizations, freeing terrorist from Gitmo.... I could to on and on....I am sure we all can. Obama has done nothing but swander tax dollars and live the high life, all the while, the middle class as fallen down the ladder, Most Americans do not vacation like they used to.. yet the obama's are constantly off to Hawaii and other places with their entourage. Here I sit with a plastic pool and a snowcone! I pray Trump will be able to fix some of the wrongs done over the past 8 years, and that he will not further the racial tensions felt in many places of the country. 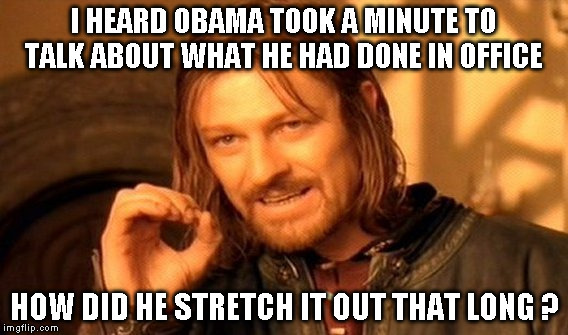 I HEARD OBAMA TOOK A MINUTE TO TALK ABOUT WHAT HE HAD DONE IN OFFICE; HOW DID HE STRETCH IT OUT THAT LONG ?